It feels like months since I was in the kitchen cooking up something to share with you. After two weeks of travel and a difficult week with a very sick dog, I can truly say I’m thrilled to get back in a routine. Our Parson Russell Terrier (Mocha) developed Addison’s Disease. I never knew such a thing existed for dogs. It’s a disease of the adrenal gland that left untreated can be fatal. Mocha is feeling much better but will have to take a monthly injection and daily medication for the rest of her life. We love our fur children. When I was looking around the blog trying to decide if I should open a can of pumpkin, I noticed I don’t have a lot of salads posted. Then I noticed I don’t have a lot of pizza either. Salad … Pizza – it was tough but I guess you can see who won the toss! I eat salads everyday for lunch so they don’t excite me like baking doughy things like pizza. 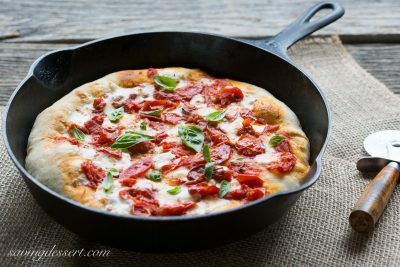 Pizza is without a doubt my favorite food … and Skillet Pizza Margherita is a super simple way to satisfy that craving. The weather has started to cool down but we still have tomatoes in the garden. I picked 1 1/2 pounds of Roma and Grape tomatoes and popped them in the oven with a drizzle of olive oil, some fresh thyme and a couple of cloves of garlic. Dice up some fresh mozzarella and pick a few basil leaves and we’re ready to roll out a crust. I used my handy-dandy all-time favorite pizza dough recipe (posted below) and tried the cast iron skillet cooking method. Not only was this pizza deliciously crisp on the bottom and soft and chewy on the top, it took minutes to cook. If you make the dough and roasted tomatoes ahead of time, this pizza will be on the table in less than 30 minutes. That makes this a perfect game day treat too. Your football fans will be so impressed when you thrown down a hot fresh homemade pizza and declare game on! 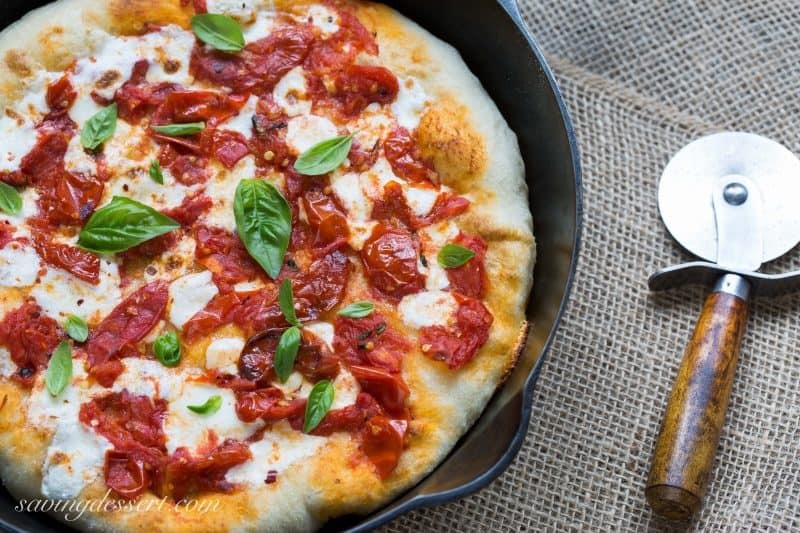 Pizza Margherita is a simple pie made with minimal ingredients. Oven roasting the tomatoes and garlic give this fresh chunky sauce great depth of flavor. You can skip the roasting and garnish the pizza with sliced tomatoes instead but I hope you will try the roasted tomatoes and sprinkle on a little crushed red pepper. Dreamy! Add the yeast to the bowl of a stand mixer. Add the water stirring to dissolve the yeast. Allow the yeast to rest for 5 minutes or until it becomes creamy. Add the olive oil and then gradually stir in the flour with a wooden spoon or rubber spatula. 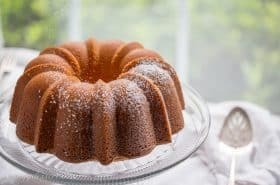 Scrape down the sides of the bowl, cover and let the sponge rest and rise in a warm place (about 85 degrees) for 1½ hours. I use my microwave as a proofing oven. It is very warm inside when I keep the task light on underneath. Be sure your dough is free from drafts. The sponge should double in volume and become very bubbly. Use a rubber spatula to deflate the sponge and fit the mixer with the dough hook. Add 2 cups of flour and the salt to the sponge and mix on low for 2 or 3 minutes. Increase the speed to medium and add a spoonful of flour, one at a time, if needed to help bring the dough together. It should be cleaning the sides of your mixer bowl. Continue to knead on medium for another 5 minutes or until the dough is smooth and elastic. Transfer the dough to a lightly oiled mixing bowl and turn it to make sure all sides are moistened with oil. Cover the bowl with plastic wrap and allow it to rest in a warm location for another 1½ hours. The dough should double in volume and hold an impression when you gently poke it with a finger. While the dough is resting prepare the tomato topping. Preheat the oven to 375 degrees. Remove the stems from the tomatoes and slice in half lengthwise. If the tomatoes are extremely watery, gently squeeze out some of the seeds. A little juice is good you just don't want them watery. Lay the tomatoes in a single layer on the baking sheet, cut side up, and drizzle with olive oil. Add the garlic and toss gently to cover. Sprinkle the tomatoes with the thyme leaves, salt and pepper. Roast for 30 - 40 minutes depending on the size of the tomatoes. 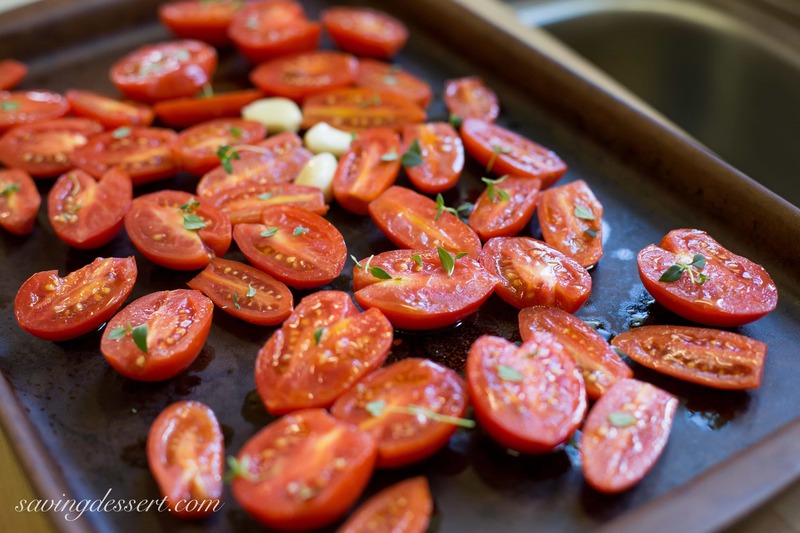 Remove the tomatoes and garlic from the oven and place in a medium bowl. Using the back of a fork, gently crush the tomatoes and garlic together leaving some pieces chunky. Pierce the tomatoes before smashing or they will spit juice in your face - just saying. Set aside. When ready to cook the pizza place the cast iron skillet on the stove top and heat (ungreased) on medium heat for at least 10-15 minutes. If the pan begins to smoke, reduce the heat. Preheat the broiler to LO with the oven rack in the center. Turn the dough out onto a lightly floured work surface. Divide the dough into two or three pieces (depending the size of your skillet) and cover the pieces set aside to work with later. Shape the dough into a ball and then flatten into a disk. Roll the dough into a 10-inch circle (for a 9 inch skillet) using a rolling pin. If the dough snaps back and doesn’t hold it’s shape, let it rest a few minutes then try again. Transfer the dough to the pizza peel or rimless baking sheet dusted with cornmeal. Spread half the diced mozzarella on the pizza dough. Spoon half the tomatoes and garlic on the prepared pizza leaving some cheese uncovered. Slide the dough into the hot skillet on the stove top. Immediately place in the middle of the oven with the broiler on LO with the oven door propped open. Broil for about 5 minutes. Once the cheese melts you can move the skillet up to a higher rack if needed to brown the dough. Watch it carefully as it can burn in a few seconds. Remove from the oven and cool slightly. Garnish with fresh basil leaves and a dash of crushed red pepper if desired. Serve immediately. NOTE: If you want to make the dough ahead of time wrap each piece of fully risen dough in plastic wrap, then place it in a Ziplock bag. Store it in the refrigerator for up to 2 days. You can also wrap it tightly and freeze until needed. To thaw the frozen dough, place it still wrapped in the refrigerator overnight. Both frozen and refrigerated dough should be allowed to come to room temperature before shaping - about 2 hours. Thanks so much for stopping by! I hope you have a wonderful week. Thanks Lorraine 🙂 Have a wonderful week! I’m so glad Mocha will be OK…so hard when our furry friends aren’t 100%! 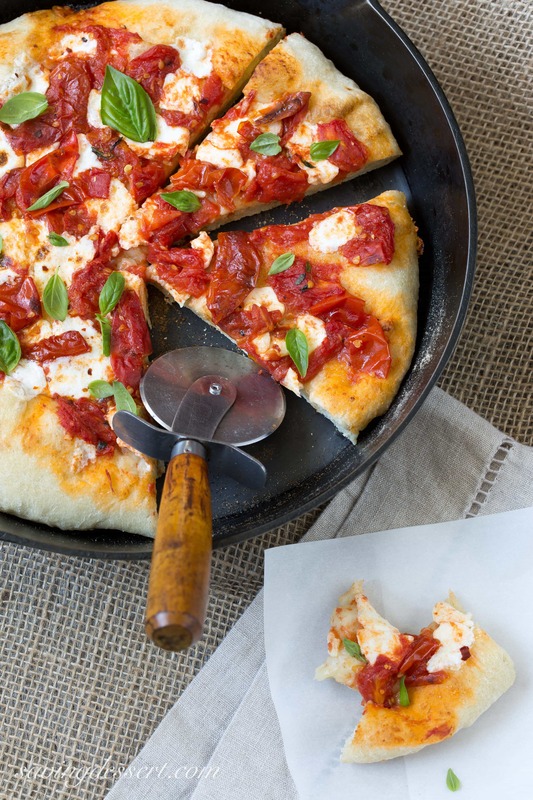 I’m so glad you picked pizza—pizza margherita is the one pizza the whole family loves. I’ve never made it in a skillet, but I will now! Thanks Liz – hope you give it a try. I was impressed with how easy and quick it came together. Yummy! What a beautiful skillet pizza you made. 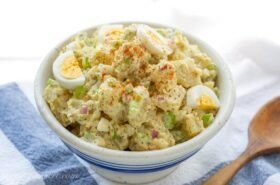 It looks delicious and would be a crowd pleaser in my family. 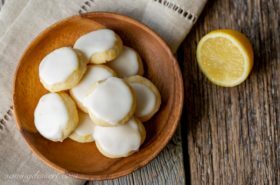 Thanks Gerlinde – it is easy to make – hope you will give it a try! So sorry to hear about Mocha. She is lucky to have such wonderful parents! This pizza makes my mouth water. I’m glad you chose pizza over salad! Thanks Cali 🙂 Salad is always a good option too – as long as pizza is included! Oh, your poor little pup. I know what it’s like dealing with those things, but we’ve never experienced this. Good luck, Tricia. And this pizza looks deadly! Thanks Abbe – I know you love your fur babies too. Have a great week! I’ve made skillet pizza for years but I haven’t made one for months. I’m ready for a pizza right now. This is beautiful! Thank you Maureen – I am so happy to have found this method – I love it! I still had the salad too Anna – 🙂 Thanks for stopping by! A friend of mine has an Airedale with Addison’s (I wonder if it’s more common in terriers?) and she too went through a lot before learning that was what he had. He’s on medication to control it but ‘who knew’ is right. 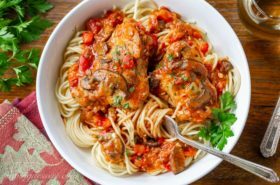 What a treat you whipped up as your return to the kitchen! This look so comforting and I love that it’s in a skillet to boot. Hey Toni – my vet said they see Addison’s more often in standard poodles, Portuguese Water dogs and some terriers. Poor little Mocha is only 17 pounds so she can fade quickly. We’re getting the medicine worked out and I think she will have a pretty normal life. It’s the inability to deal with stress, good or bad, that is the difficult part. Extra medicine when company comes for the weekend or when we go camping, etc. Weird disease that can send her into a trance like state. Thanks for stopping by and have a great week! what a lovely idea… it looks so simple and so delicious. Nothing beats a pizza and I must admit I love that slightly fried pizza crust taste! What a neat idea Tricia. Fabulous for a weekend lunch. Thanks Larry – love me some pizza! Your photos always make me wish I lived next door! This looks like a wonderful way to serve pizza. Thank you so much Beth – I was impressed with the results and how easy it was to get on the table – yummy! What a beautiful and delicious way to focus on the last of summer tomatoes and fresh basil. I’m sorry to hear about your Mocha. I do hope the treatment will keep her comfortable and happy!! Thanks Bonnie – and I appreciate the kind words about Mocha. She is feeling better and I hope will be herself again soon. Love this pizza and the cooking method is great! I hope you try it Susan – I can’t believe how easy and delicious. 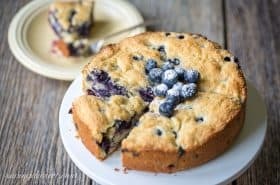 It makes a wonderful crust and cooks in minutes! We are pizza lovers and I just made a few too..the first time I used a skillet we had tried Uno pizza ..Chicago pizza..in Massachusetts..
We love so many different kinds..different toppings..in Italy I always had Margherita. Thank goodness your furry friend could be helped. Hi Tricia, we are always in the mood for pizza, and this looks like a real winner. Margherita is my favorite. Great choice in picking the pizza! Margherita is my favorite now that I’m a “grown-up”. Can’t beat the simple, delicious flavors in this pie. 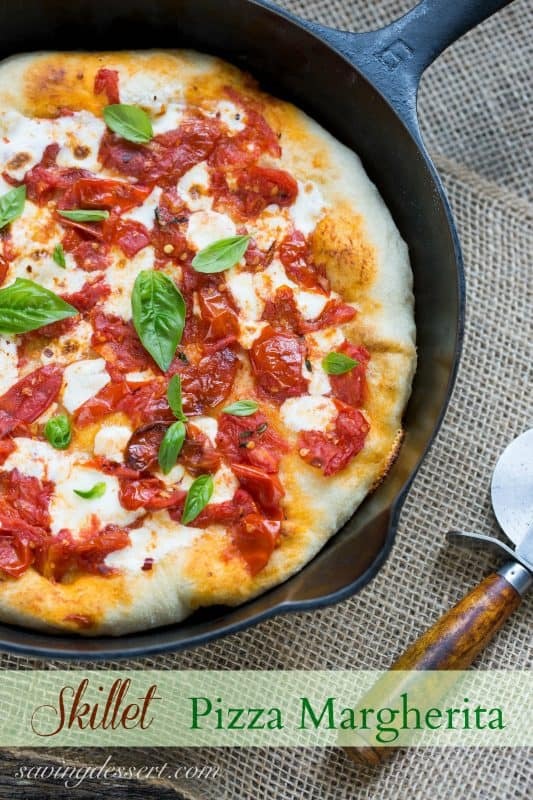 I need to try making pizza in a skillet like this! Thanks Monica – I really loved the way the crust baked up in a skillet. I will use this method again … probably sooner rather than later 🙂 It is more like a brick oven pizza than any other I’ve made before. Yummy! Beautiful pizza! I love skillet pizzas. The cast iron cooks the crust so well 🙂 Sorry to hear about your dog. I know it’s always a worry, but glad she is doing ok. Thanks Jennifer – you make the most beautiful pizzas ever – and I know you would like this one too. Thanks for the well wishes for Mocha – so hard to have sick pets. Poor Mocha, and I am so relieved to know that she is getting better. The pizza looks terrific! Thanks Angie – I know you love your pets too – the pizza is great! Have a wonderful week. You will love skillet pizza Sue – the crust really does resemble a brick oven. So surprised I love it so much. Especially love that it cooks in minutes! I’m always in the mood for pizza and pizza margarita is my favorite. This looks so good and I can almost smell the delicious, yeasty aroma. So sorry about your doggy, it’s so sad when they get sick as they’re so helpless on their own. Glad he seems to be better and that there’s treatment for him. Me too Chris. This pizza dough really has that great yeast aroma and thanks so much for the get well wishes for Mocha. She is feeling better – what a strange, odd disease. President John F Kennedy had Addison’s but I am very sure people and dogs are different 🙂 Have a great week.